VIPAccessEXCLUSIVE: What Is Inside Luxor Box’s May Subscription Box? Find Out In This Unboxing Video Here! It’s certainly the gift that keeps on giving — we’re talking about everyone’s latest obsession… Luxor Box! You’ve definitely heard all of the buzz about Luxor Box and let’s just say that the buzz is truly worthy. Luxor Box is an extraordinary subscription box service that ships out every other month. What could possibly be better than receiving an exceptional box filled with four to nine of some of the most luxurious, high-class and terrific quality items? It’s the greatest surprise to look forward to. Luxor Box truly exudes such class and elegance! There are a lot of subscription box services but none of them can compare to Luxor Box. This brilliant and unrivaled subscription box company offers two options – the Luxor Box plan which contains between four to nine items that together have a value of over $275. The Luxor Box plan ships out to both the United States and Canada. Just as much fun but smaller in size is the Petite Box plan. The Petite Box contains between two to four items and together has a value of over $75. The Petite Box ships out to the United States only. With whatever plan you subscribe to, you are bound to be mesmerized by Luxor Box and the joy that it brings with all of its magnificent products. Luxor Box goes above and beyond to bring the best of the best to all of its clients. Luxor Box brings together some of the most phenomenal products from spa treatments to accessories, home decor, skincare products and beyond. The value of the items in Luxor Box surpasses the amount you are paying for your subscription plan so you are definitely getting a bang for your buck. All of the items in Luxor Box are from renowned brands that are praised for their superb quality. Luxor Box gives subscribers their very own happy place as soon as they open the beautiful, turquoise-colored box. The box alone is so gorgeous and just wait until you see all of the extravagant goodies inside. Luxor Box puts so much effort and thought into selecting the items in each of the boxes. The items also manage to correlate with one another. For instance, in this month’s box, there is a sarong from Tilo and shades from WeWOOD, amongst many others. These are two items that are perfect to use together for a nice, summer day out on the beach. I, Alexisjoyvipaccess had the greatest honor of working with Luxor Box again to show you guys all of the marvelous items that are inside the May box. 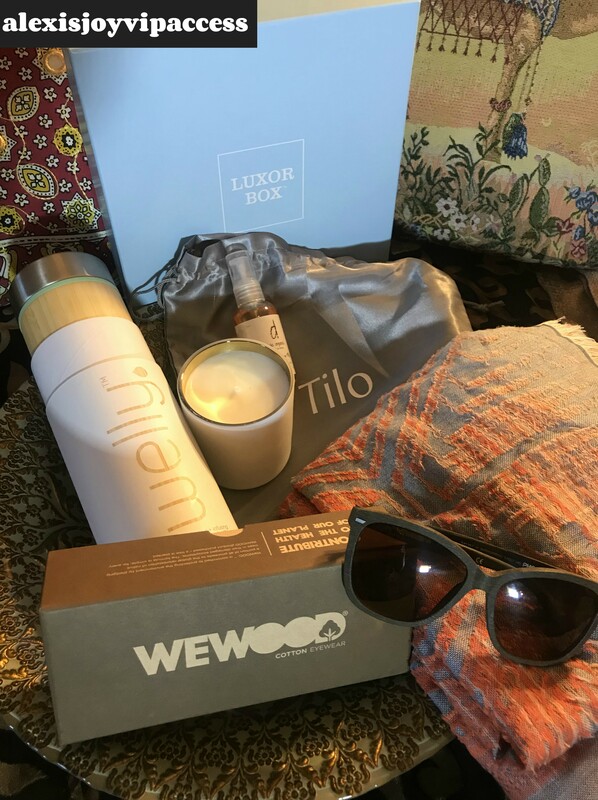 The May box has all of the summer essentials including a sarong from Tilo, an insulated and infusing bamboo water bottle from Welly that keeps drinks cold for 24 hours and warm for 12 hours, chic and stylish shades from WeWOOD (any item purchased from WeWOOD helps plant one tree and encourages everyone to help save the environment), a matte white candle from La Lueur and an uplift body tonic oil from Delia Organics. All of these products are items you can use on a daily basis. Luxor Box is an experience like no other. It truly is a piece to the equation of being happy in life. Check out my Luxor Box unboxing video of the May box below and be sure to follow @LuxorBox on Twitter and Instagram! You can join in on all of the fun by becoming a member of the Luxor Box family here. Previous Article: Debby Ryan, Matthew Morrison And More Celebrated The Orthopedic Institute For Children’s International Impact At The 2018 Stand For Kids Event! Next VIPAccessEXCLUSIVE: Robert Pattinson And Mia Wasikowska Will Leave You In Awe (And Laughing Endlessly) In The Zellner Brothers’ Film “Damsel” — RECAP Here! Thanks so much for letting us know about this wonderful Luxor box which you eloquently described the classy, 5 star fabulous contents !